Since we both got kayaks this spring, we've gone once so far, earlier this month. The weather hasn't been the greatest the past few weekends, and when it has been, Trent's been working overtime or we've been busy. We have gone a couple of other times in the past though, before we owned boats of our own. Last summer, we kayaked at Lake George, in the Loud Thunder Forest Preserve. It's kind of close to where I grew up...another small town area in Illinois maybe about 45 minutes from where we live now. It's pretty cheap to rent kayaks here (I think it was $8/hour), so we rented a couple and took them out for a couple of hours. We liked this lake because it was really calm, and it's super laid back around here. Not busy at all, just a few boats here and there. It was a nice day, though I think it was in August, so it was pretty, hot too. We started out with some life jackets on, but it was so hot and the water was super calm, so we took them off for a little while. Shh! We brought some drinks along, too. 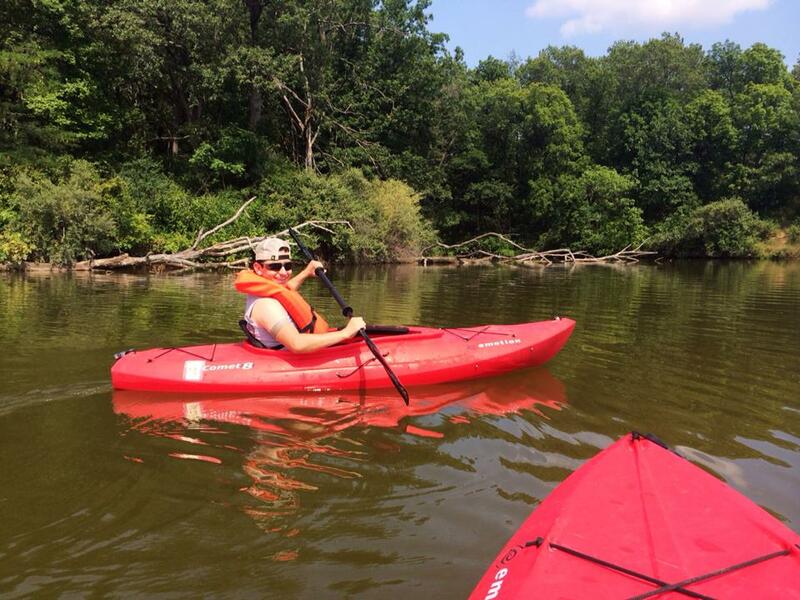 These kayaks were really nice and stable. They're Emotion kayaks, and when we bought our own this year, we definitely looked at these. They were a little bit more expensive, though, and the kind we got was actually on sale, which clenched the deal for us on the Pelican ones. 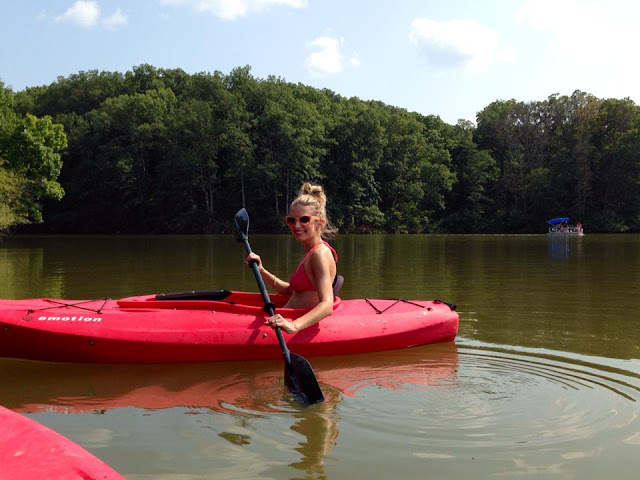 Kayaking at Lake George was my first experience with a single kayak. I was a little worried at first if I would be able to handle it on my own, but it was much easier than I thought it was going to be. To my delight, I could paddle and guide the boat on my own, directing it the way I wanted to go pretty easily. Trent had a good time, too. 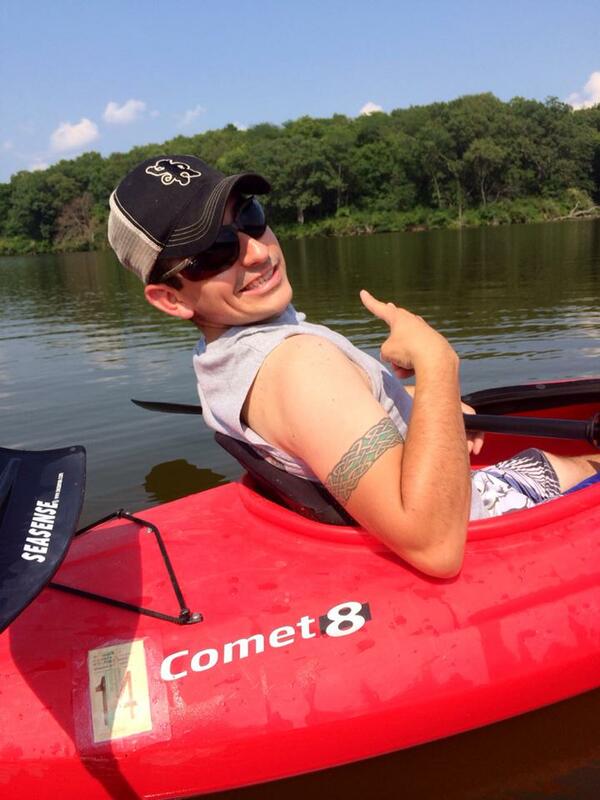 Ever since we went out that time, he had been wanting a kayak even more than before! He still says he likes this kind, because of how stable they were. They were also only 8 foot kayaks, and we got 10-footers. That experience kind of made me want our own boats, too. We had a great time that day. 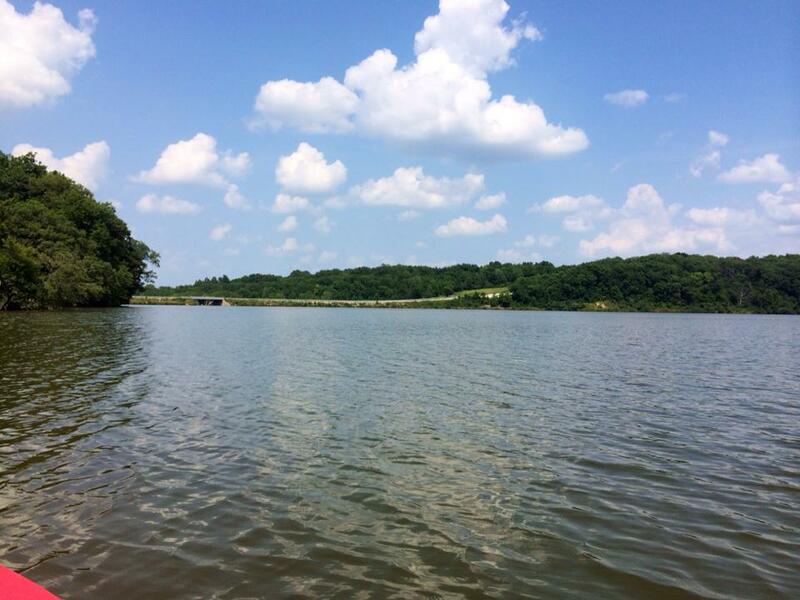 The one other time before this when we went kayaking together, was at Lake MacBride, near Iowa City. I don't have any photos from that experience, but I do have a couple from the beach. 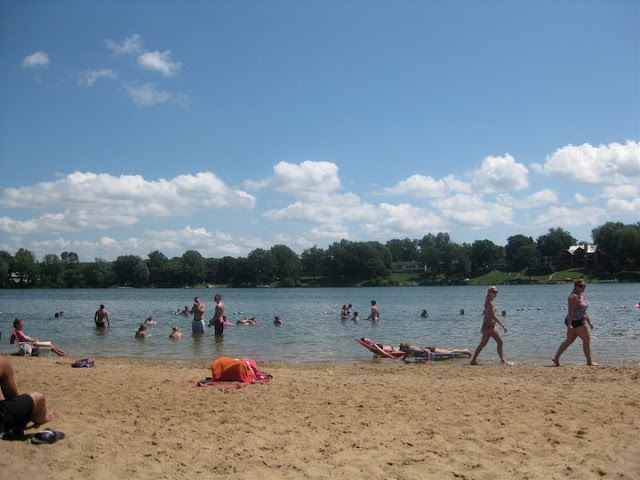 Back in 2010, we were in the Iowa City area for the weekend, and decided to make a day trip down to Lake MacBride. We hung out at the beach for a while, then rented a double kayak. 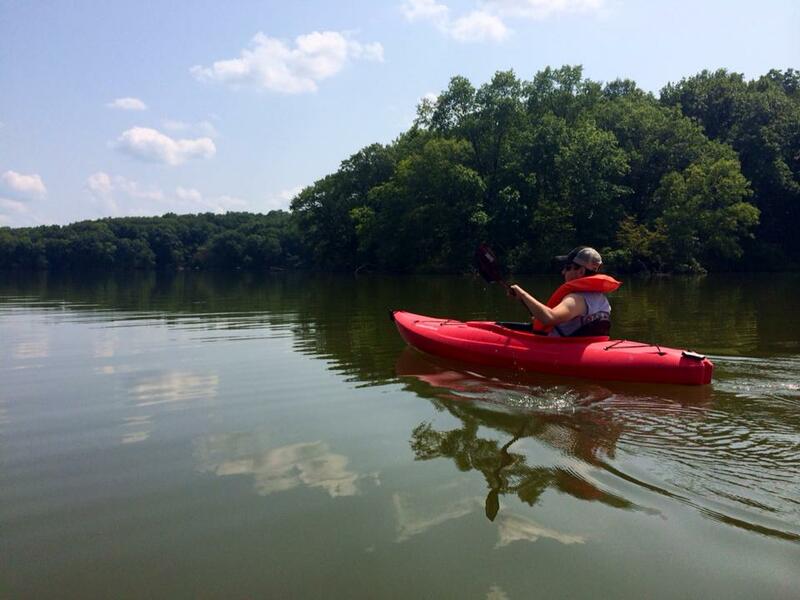 The double kayak was fun, but you definitely have a little bit more freedom with the single kayaks. Lake MacBride was also a much busier area than Lake George and Lake Storey, which both felt a little more isolated and peaceful. 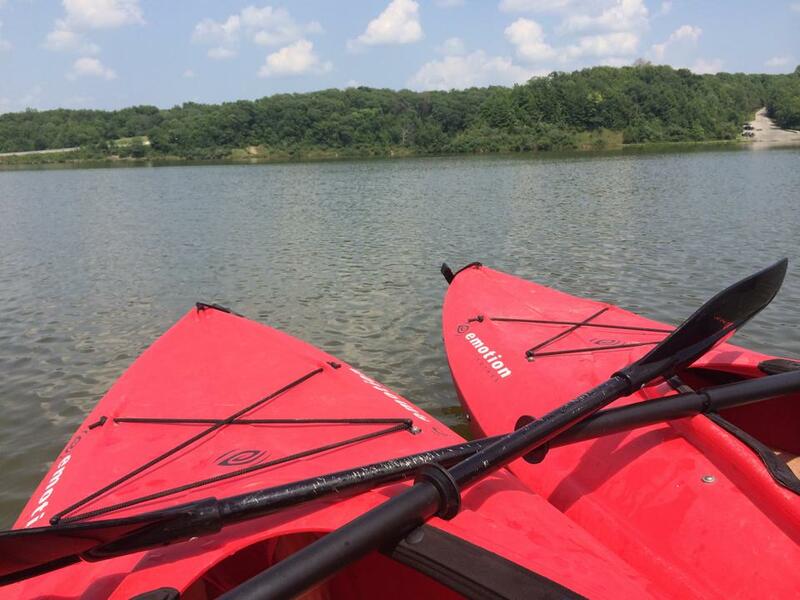 I'm hoping we can go out a few more times this summer with our new kayaks. I know we'll be pretty busy with the wedding and all, but there's always time for a little fun too, right? !